A 90-degree pop-up transfer uses multiple conveyors moving perpendicularly to each other, changing a product’s direction. The transfer shown above was built to handle multiple sizes of reams of paper. This space-saving design changes both the orientation and elevation of the product as it moves down the line. The lifting of the pop-up transfer accommodates the two different heights of the adjacent equipment. 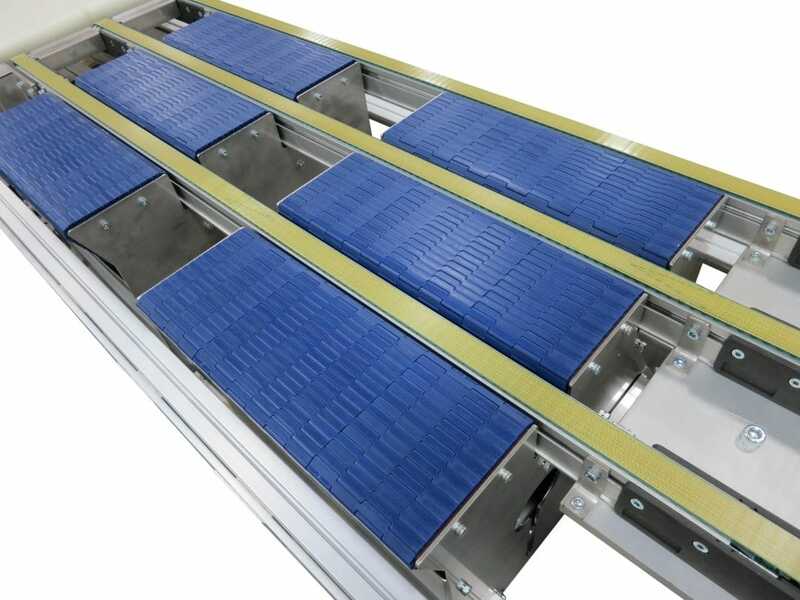 Also, the small footprint of the conveyors effectively addresses the customer’s space constraints. The stationary conveyors are custom-made serpentine designs that allow one belt to weave around the three pop-up conveyors. This design means fewer motors and fewer drive components – saving costs and maintenance time. They’re equipped with a plastic micro-pitch chain belt designed for tight transfers. The pop-up conveyors are 2200 Series Precision Move timing belt conveyors. They are gang driven by a single motor to run at the same speed. The elevating mechanism is a pair of guided pneumatic cylinders tuned to lift at the same rate. Dorner’s Engineered Solutions offers a wide variety of custom conveyor system solutions to meet your needs. See what we can do.